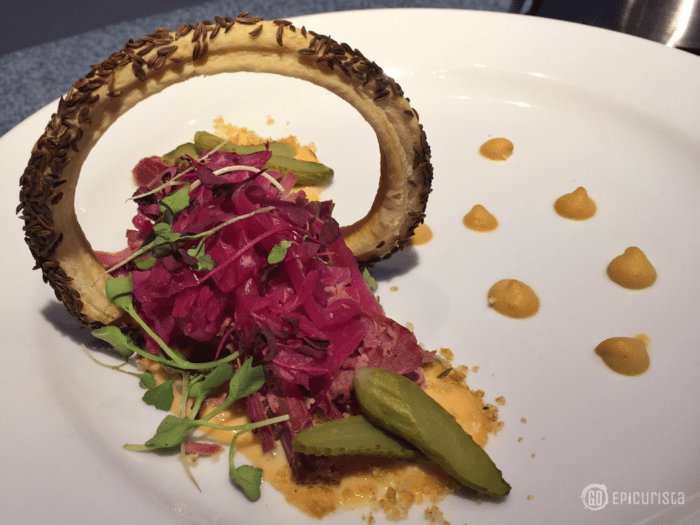 Disney wows guests with new festival celebrating culinary, visual and performing arts! 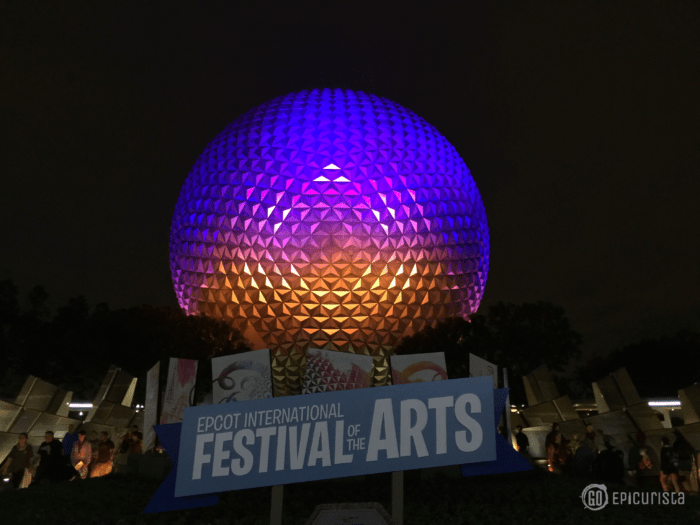 Epcot International Festival of the Arts is not to be missed during six inspired weekends, Fridays through Mondays, Jan. 13-Feb. 20, 2017. The Festival features new art, artists and shows each week, making each weekend original. Enjoy culinary studios, galleries, Art of Disney shops, merchandise tents, interactive workshops, hands-on experiences for the whole family, favorite Disney characters channeling their favorite artists, and seminars. It’s a colorful, whimsical celebration of a new artful Epcot. The festival is included with regular Epcot admission. Get there early and stay all day. Here’s what you can expect! 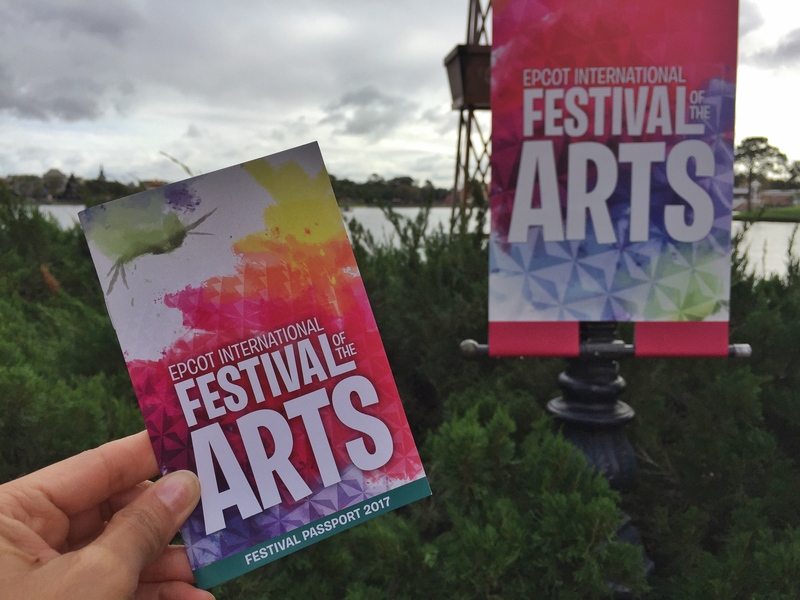 The complete Epic Guide to 2017 Epcot International Festival of the Arts. Don’t forget your Festival Passport! ^ Pick up your Festival Passport at the park entrance or in any of the shops so you can check off each dish and drink you sample as you go along. It will help you keep track of your favorites. Plus it’s a fun souvenir. ^ Purchase a wrist band gift card at one of the merchandise shops. 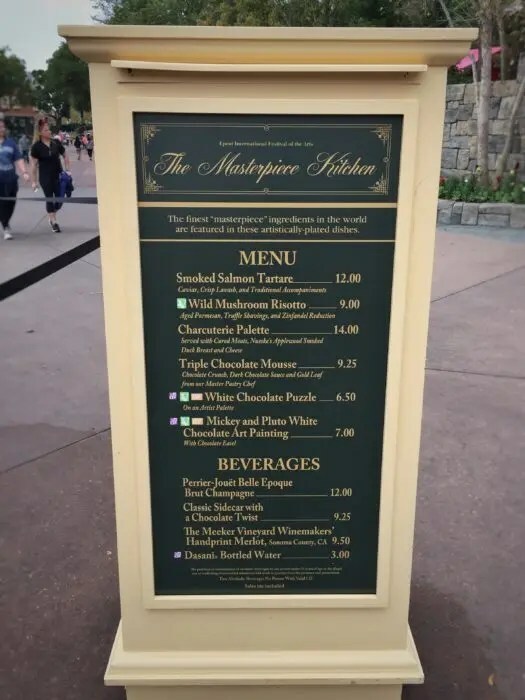 You can add any amount you desire and it will make paying for your purchases throughout the park much easier, plus help you manage your budget. ^ Wear comfortable clothes and shoes. Dress in layers for the warm days and cool nights. A good pair of comfy walking shoes will serve you well. You will thank me later. ^ Don’t forget an umbrella or poncho. It’s Florida. Afternoon showers come out of nowhere. 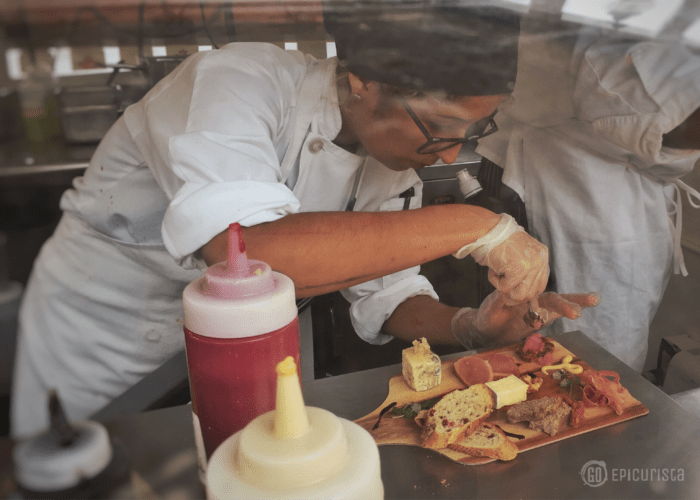 The Epcot International Festival of the Arts features all- new, never before seen, Food Studios located around Epcot’s World Showcase. Food Studios showcase culinary creations so delicious and intricate, guests may not know if the menus are for admiring or eating. Disney chefs encourage guests it’s the latter. 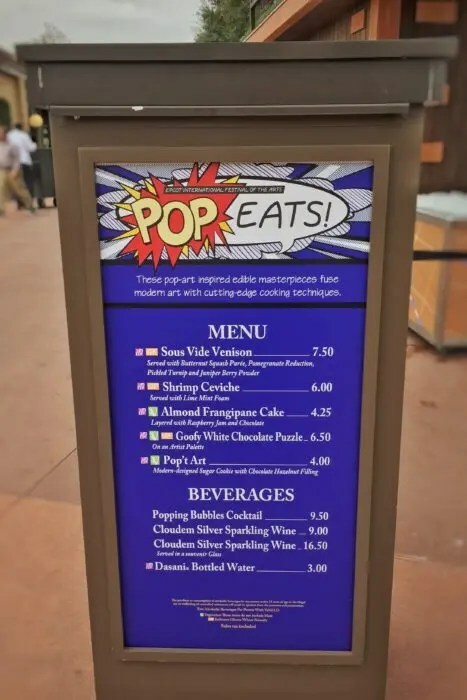 Similar to the food kiosks made popular at Epcot International Food & Wine Festival, however I must note these “Food Studios” have taken artistry both in flavors and presentation to the next level. I was quite impressed with the dishes and drinks being served in a “festival” setting and I think you will too! Expect a more upscale experience. No paper boats or paper plates. Dishes and drinks are served in more refined disposable wares. Expect a bit longer wait as dishes are artistically assembled before your eyes. 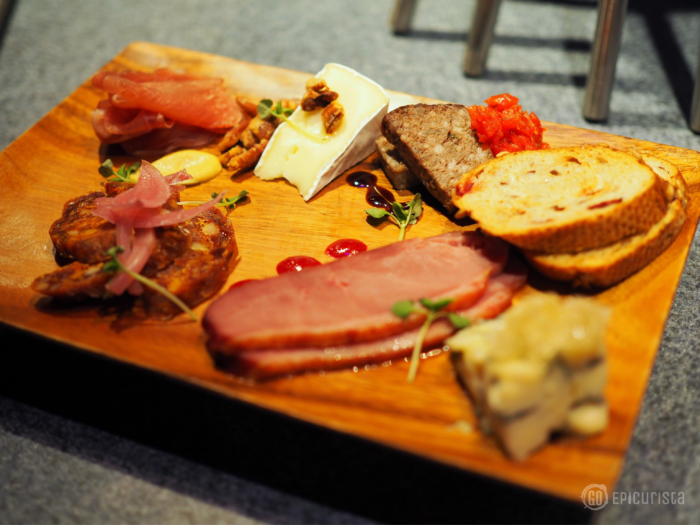 The charcuterie board for example has 14 ingredients all displayed beautifully by the trained Disney chefs. Here is a list of the Food Studios and their menus. 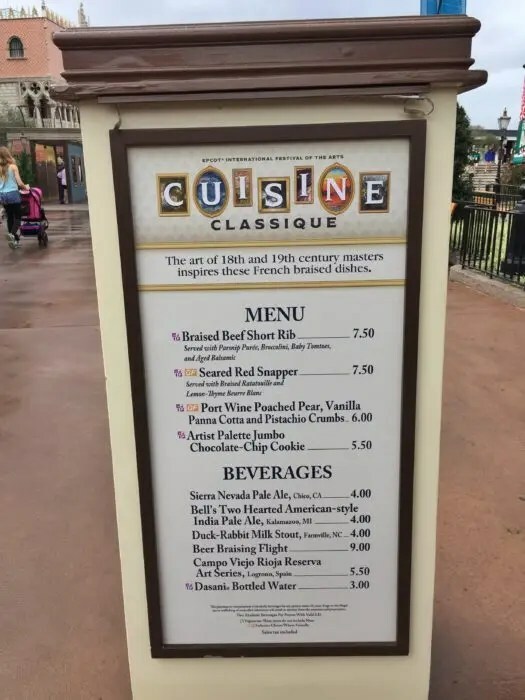 They are listed in order as you walk from the front entrance of Epcot and turn left, clock-wise around the World Showcase Lagoon. Please note: Gluten Free items are marked “GF,” and Vegetarian items are marked “V”). 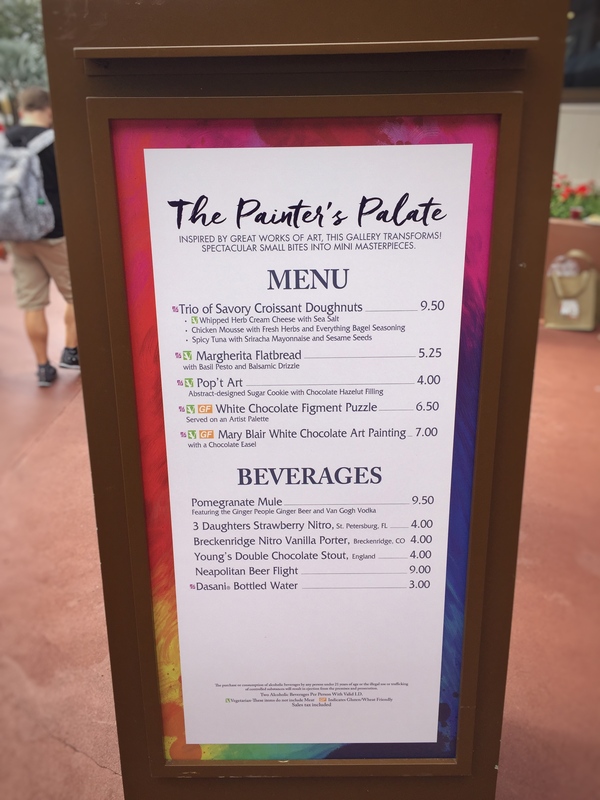 Located inside Odyssey Festival Showplace, here you will not only get to sample some beautiful dishes and beverages but also enjoy the historic works of art from Disney legends Mary Blair and Herb Ryman. Plus, it’s indoors so it offers a bit of respite from the sun or in case of inclement weather, and has plenty of tall tables. ^ Breckenridge Nitro Vanilla Porter, from Breckenridge Colorado. ^ 3 Daughters Queens Court Strawberry Blonde Nitro, from St. Petersburg Florida. ^ Neapolitan Beer Flight: All three of the above beers. 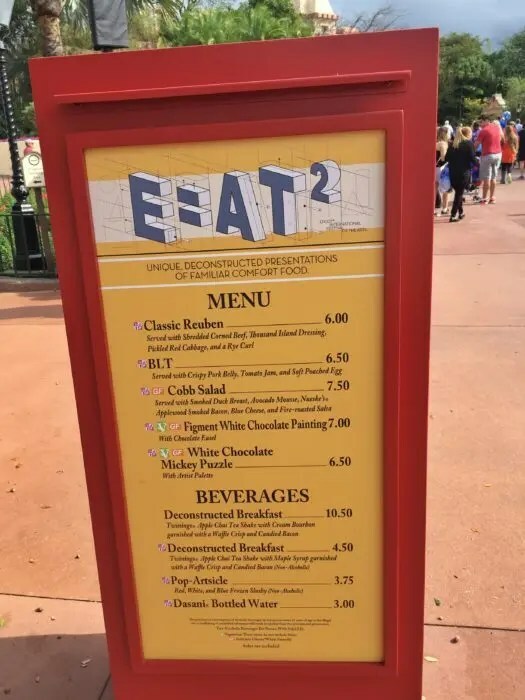 Located in Showcase Plaza, this culinary studio features unique, deconstructed presentations of familiar comfort food. 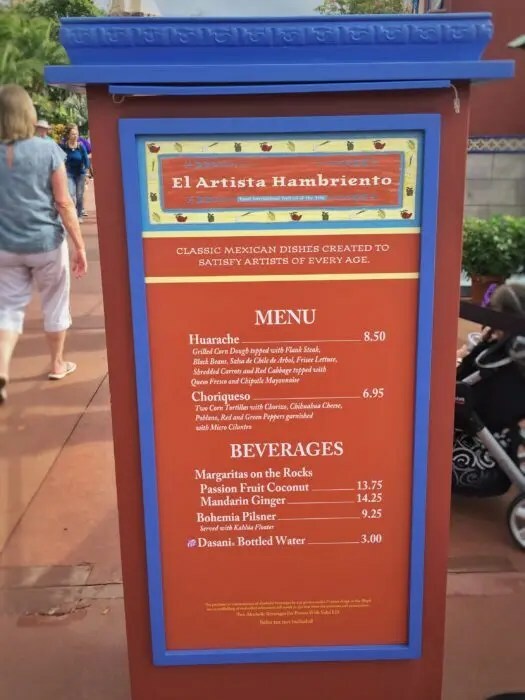 Located near the Mexico pavilion, “El Artista Hambriento” translates to “The Hungry Artist”. Guaranteed you won’t be hungry after sampling all these festival bites. 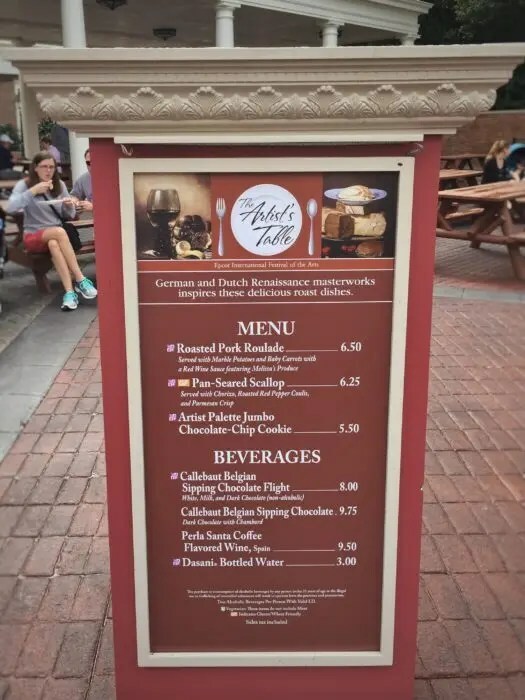 Located near the Canada pavilion. The finest “masterpiece” ingredients in the world are featured in these artistically plated dishes. Located in Showcase Plaza. 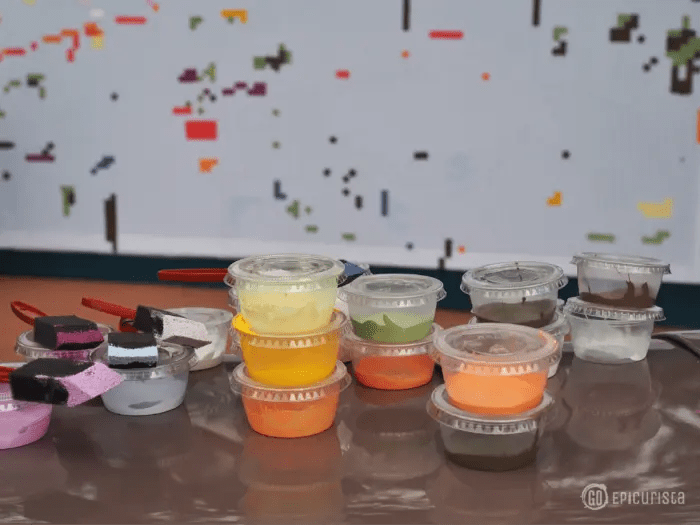 These pop-art inspired edible masterpieces fuse modern art with cutting-edge cooking technique. 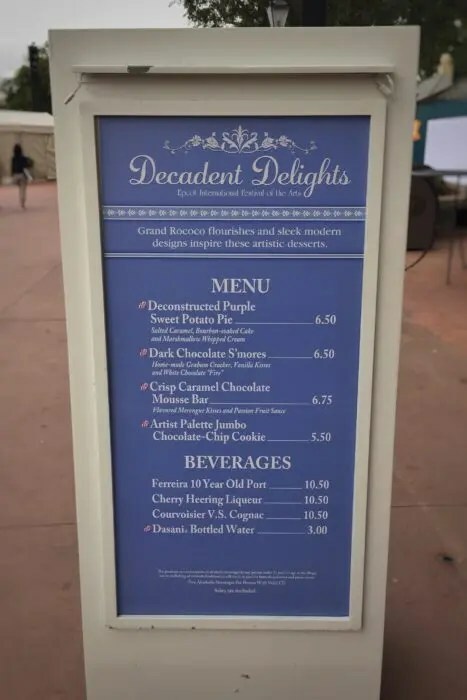 You’ll find more delicious treats throughout Epcot. 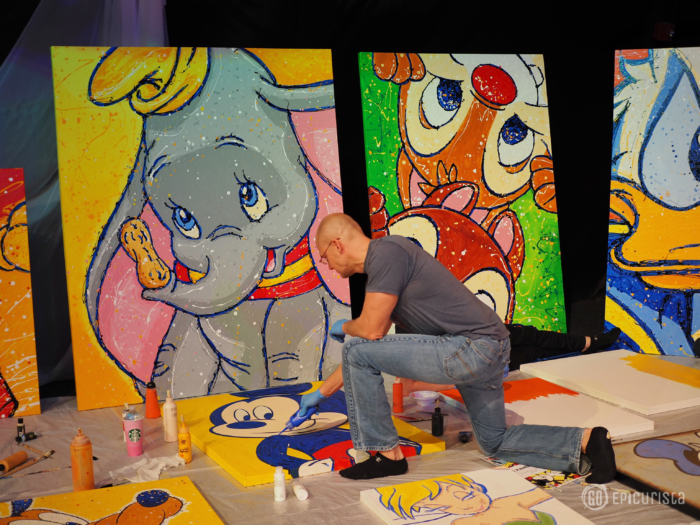 Disney Artist Joe Kaminski paints a masterpiece before our eyes! Here’s a few of the galleries not to be missed around the park. ^ Odyssey Festival Showplace: located in Future World East. See featured Festival galleries including work by Mary Blair, Herb Ryman and Disney Original Art. Ever wondered what those original concept sketches for Epcot look like? Want to see drawings for some of Disney’s animated films and rides like The Three Caballeros? Don’t miss this stop. ^ Art of Disney: located in Future World West. Includes a dedicated art shop with art reproductions, original works of art and Festival merchandise. ^ Mexico Folk Art Gallery: Located inside the Mexico pavilion. See traditional wood carvings and learn about Oaxacan culture and daily life. ^ American Heritage Gallery: Located inside The American Adventure Pavilion. Take a journey through time with this art exhibit representing 400 years of African American achievement. ^ Walking Chalk Gallery: Located in World Showcase. Discover the work of imaginative chalk artists inspired by great art and the world around them. ^ Merchandise Tents: Located throughout World Showcase. Visit over 15 locations featuring Disney and visiting artists. New art is on display each weekend. Ashley Brown, the original Mary Poppins of Disney on Broadway! 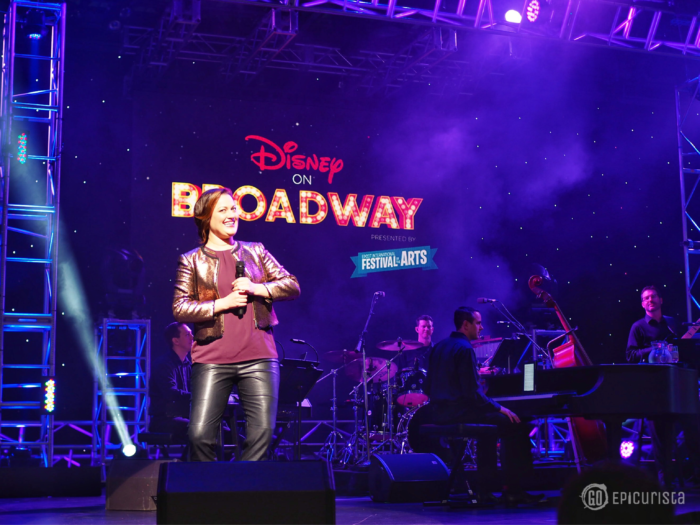 In the inaugural year of the Epcot International Festival of the Arts, a collaboration with Disney Theatrical Productions brings an exciting new showcase of favorite music and Broadway talent to the America Gardens Theatre stage. Performances held at 5:30 p.m., 6:45 p.m. and 8 p.m. Friday through Monday of each festival weekend. A fun high energy performance by a special guest visual artist on stage painting favorite Disney characters. Held at the Fountain Stage. Artistic performers come to life right before your eyes in front of the Fountain Stage. Through a partnership with Disney Performing Arts, enjoy jazz ensemble performances by some of Central Florida’s finest high schools and universities. Held at the Fountain Stage. Don’t just sit back and watch. Be a part of the art! Explore a variety of artistic topics such as Photography, Food Styling, Watermelon Carving, Soapmaking, the art of Disney Topiaries ad more. Located in the Odyssey Festival Showplace. Take part in special workshops such as “Ink & Paint Animation”, Modern Calligraphy, Artfully Blending Tea. These events require additional fee. Reservations required at 407-WDW-TOUR or visit Odyssey Festival Showplace. Visit Odyssey Festival Showplace for your gallery guide. See a masterpiece take shape right before your eyes. Grab a paint brush and join in on the fun! Put yourself in the painting! Cross the Delaware with George Washington, scream along with Edvard Munch, join Monet for a day of immersive photo stops throughout World Showcase. What are you most excited to see, taste and hear? Follow the hashtag #ArtfulEpcot to see everyone’s photos and let me know if you have any questions. 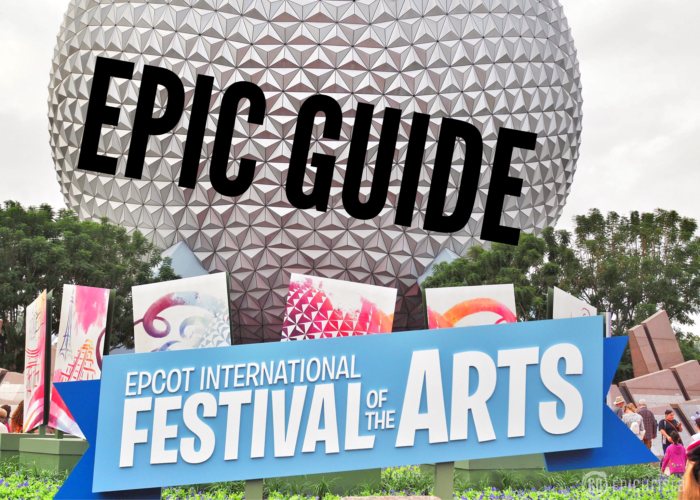 I hope this epic guide to 2017 Epcot International Festival of The Arts will help you map out your day and take advantage of all there is to enjoy! Disclosure: I was an invited media guest for a Festival preview event, however, I am a Disney Annual Passholder and all opinions are my own. As always, I only share with you experiences worth celebrating to inspire you to go #MakeSomedayHappen one delicious bite, sip and trip at a time! Last shot of the night at Epcot International Festival of The Arts!